In this activity, your students will test liquids to see which ones can clean the tarnish off a penny. Then, when one penny changes from dark and dirty to bright and shiny, they’ll have a chance to think about where the tarnish went. 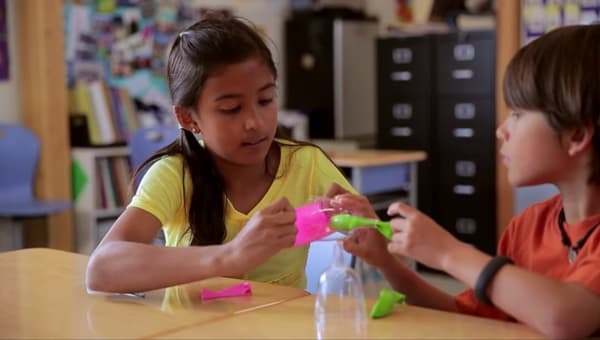 In a class, this activity works best when students work together in groups of four, but students can also work alone. Review the instructions in Step 4 before you begin. In the next Mystery, you’ll need to reuse some of the materials from this Mystery so students can copperplate a steel nail. If you’re working with a small group or solo student, you can make 1 cup of each solution, rather than 2 (see Step 3). When you set up your stations, just cut the “recipes” in half. If you’re working with a class, we suggest asking students to bring in pennies made before 1982. You can also buy penny rolls at the bank. We bought $3 worth, sorted out the pre-1982 pennies, and had exactly 40 to work with. For each student, print out one “Alchemist’s Potion, Part 1” worksheet. For each group of students, or for a student working alone, print out one “Test like an alchemist” page . Print out labels and label your four containers. Station 1: Mix 2 tablespoons liquid detergent with 2 cups water in the Soapy Water container. Station 2: Pour 2 cups of vinegar into the Vinegar container. Save student work: Students will need their completed “Alchemist’s Potion” worksheets for the next Mystery. Make sure they’re stored somewhere safe. Add a nail: After students have left class, we recommend that you put a nail into the Salty Vinegar solution with the pennies—but don’t tell your students you’re doing it. You’ll find out why in the next Mystery, when your students will discover that the solution the pennies soaked in can change steel nail in a surprising way. This mystery includes two activities: a baking soda explosion in a plastic bag (carefully designed to avoid a mess), and a hands-on model that helps students understand why the plastic bag explodes. We strongly recommend students wear eye protection for this activity. Students will work in pairs for the first activity, and in groups of four for the second activity. Students working alone will need a partner for the first activity, and a few friends to help with the second activity.